Musketeers is one of those shows that I found myself accidentally falling in love with and becoming mildly obsessed with, despite the fact that it’s a hugely flawed production. I’ve always thought it’s a near perfect setup and am astonished that it took so long to become a television series (not forgetting Dogtanian and the Three Muskehounds of course). The four heroes are classic characters, the themes of loyalty, camaraderie, honour and betrayal are pretty universal and there’s plenty of opportunity for action, romance, thrills and humour. I’m guessing the period setting puts people off (although how good could a present day version be? ), so it’s not surprising that it’s the BBC that finally took a run at it. Frustratingly though, it seems the BBC gave up on the show before it even started, showing it hardly any love or support with the basic error of poor scheduling. I’ve always figured that the first season of the show was half written for a family Saturday evening slot to replace Merlin, but then pushed it to Sunday at 9pm, where its tone wasn’t a good fit, marketing was non-existent and its ratings suffered accordingly. Friday at 9pm for the 2nd season wasn’t much better and the 3rd season was announced as the last. By which point the BBC jut gave up altogether and scattered it around the schedules – Friday, Saturday, Sunday, Monday… you name it, it aired there. You can’t really blame the writers for feeling a bit peeved and lazy, but I wish they’d been just a bit better. The writing has always rather suffered from a focus on what needs to happen to support the immediate plot, often sacrificing the long term consistency. Too much of the previous seasons was spent with Machiavellian villains repeatedly getting beaten in their weekly plot, while the Musketeers still manage to come out behind. The writers took a particular “well sod it” attitude towards things in the final season, basically writing plots and moments to keep themselves happy and playing pretty fast and loose with credibility of both plot and character/relationship development. The four year time jump between series two and three simultaneously left too much time passing and yet not enough changing. Aramis left them for four years, Athos had to be a captain rather than one of the men, and yet nothing really changed. Other than a couple of remarks, by episode two Aramis was completely re-integrated and Athos still went on every little adventure. D’Artagnan’s character actually did seem to have matured in those years, and the others did treat him more like a peer than a junior. But despite the title of the series, it turns out that it’s Constance who really got the best development. She had some good material in the first two seasons, but in season three she is confident, commanding and a wonderful foil to all the male characters. Tamla Kari’s beautiful performance blended a woman taking control while not losing her emotional core and uncertainties. The poor consistency for the Musketeers themselves is frustrating because all the actors are more than capable of great performances, individually and as a group they’re hugely charismatic and versatile making each character a complex individual building from the classic archetypes. The characters and actors play off each other, always forming a balanced set. Athos, Porthos and Aramis as the triangle in everything – sword, fists and gun; head, heart and soul, thought, action, words – while D’Artagnon is always in the middle, tying them together or pushing them apart depending on what’s needed. You could pick any small scene and watch the poetry in motion of the actors and characters working and moving together to make a unit. Individually they’re ok, but together they’re wonderful. Unfortunately, I’m not sure the writers fully understood that and it was the very last episode that left me frustrated both as a critic and as a fan. The writers knew this was the final season and they wanted to basically go out with a huge bang while also tying everything up in a perfect bow. This required some particularly clumsy manoeuvring to get people (and history) in the right places. As a critic it was a frustrating exercise in fan-service with very few of the happy endings really feeling like they were earned. But the bigger problem is that as a fan, I still wasn’t satisfied. You see the final resolution for our four musketeers is that each of them individually get their happy ending. Athos who had been driven to be a soldier because of the betrayal of his wife, gets the girl and a baby on the way and leaves soldiering for them. Porthos who had come from the streets and was treated as the muscle, is recognised for his leadership and strategising and made a general. And spontaneously gets married to a woman who doesn’t mind him soldiering (despite the fact that her husband, and father of her new baby, was killed on a battlefield). Aramis who craved adventure and as many women as possible to escape memories of the true loves he’d lost, left the musketeers to become First Minister of France where he can be near to the Queen and watch over his son. ‘Trainee’ D’Artagnon became captain, running the musketeers with Constance. Each is a happy stories individually, but they missed the point of what I loved about the stories of the musketeers – the group of them together. How can it be a happy ending when they are going in different directions? Despite the somewhat clumsy plotting, and that somewhat sour end note, the series was never anything other than entertaining. I wonder what this show could have been if only the BBC had committed to it more. With the mixture of action, comedy, romance and drama; not to mention the incredibly detailed and beautiful period sets and costumes; it should have been a perfect candidate for an absolute hit. As it was, it’s a show that I suspect I will always remember more fondly than it maybe deserves, giving it the benefit of the doubt for what it came so close to being, rather than the slight mess that it actually was. I had real problems with Season 1, because both my brain and the writers were expecting this to be a Saturday evening family show that was instead scheduled at 9pm on a Sunday. The slot that was home to Doctor Who, Merlin, Atlantis and Robin Hood seemed a perfect fit for a show about the swashbuckling Musketeers. But the 9pm slot required more adult storylines and the writers and actors struggled for a bit to find the right tone. But after a while they all settled down and the season ended on a pretty high uptick, leaving me pretty optimistic for season 2. Long story short, I wasn’t disappointed. Despite meandering to yet another timeslot (9pm on a Friday, traditionally known as the graveyard slot in America at least), the season was much, much more consistent and a lot stronger in terms of plots and characters. The arc storylines held everything together nicely and reduced the formulaic feeling that the first season had, even though there was still a bit of a tendency to focus on one character at a time. The Three Musketeers as always been one of my favourite stories, or should I say set ups. It’s not the actual plots that make or break something based on Dumas’ book, it’s picking up the characters and the setting and then doing something interesting with it. The Musketeers is managing that very well. The focus is always on the characters and the camaraderie between them. The period is beautifully vibrant, both in production design and in the history of the period with lavish richness in the palace and extreme poverty and violence outside. The series also has plenty of entertaining banter and exciting action sequences so there’s rarely a dull moment. It’s entertaining, interesting and emotionally engaging. What more could I want? The BBC seems to have an ongoing commitment to producing Saturday evening family dramas, shows that appeal to young and old by covering the full spectrum from fart jokes to existential crises, sometimes elegantly integrating the two (Doctor Who) and sometimes just swerving wildly between them (Merlin). I’m quite a fan of this type of show, at worst it makes for a mindless 45 minutes or so while eating dinner and as a bonus sometimes you get something a bit more substantial on top. So when the BBC announced they were doing a version of The Three Musketeers I was *almost* excited. I’ve loved the story of the musketeers since I was introduced to it via Dogtanian and the 70s comedy films starring Michael York and Oliver Reed. The story seemed a really good fit for Saturday evenings on BBC – swashbuckling action, palace intrigue, handsome young men with just about credible reasons to take their shirts off and friendly banter and camaraderie by the bucket load. So I was rather surprised when rather than being a Saturday at 7pm show to fill in the gap left by the departure of Merlin, Musketeers appeared on Sunday at 9pm show. That immediately confused me, Sunday at 9pm is a very different timeslot, no kiddies to appease with running and swashing of buckles and instead an expectation of something a bit more thoughtful (The Crimson Field is now in the slot since Musketeers finished its run). 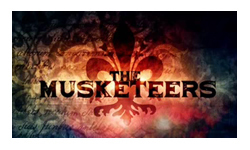 I’m not sure Musketeers ever got over that confusion. While the absence of bodily function jokes was a blessing, the darker story lines never felt like they were really being committed to. Elements of the show were still a little camp (yes Peter Capaldi, I’m looking at you and your beard) and somewhat silly when compared to the tone of some of the actual plots about the politics and acceptable actions of the period. The repetitiveness of the stories really didn’t help either. It felt like pretty much every week one of the Musketeers found the love of his life, who was then placed in jeopardy and eventually had to be given up because being a Musketeer is too important and/or too dangerous to allow long term relationships to work out. The first couple of times it was interesting, but it got old pretty quick once it had looped past each of the four Musketeers at least once. Of course The Musketeers lives and dies with the four main characters, and it took some time for the actors and audience to settle in with the characters. They’re iconic roles and the relatively unknown and inexperienced actors didn’t immediately bring them to life. It took me several episodes to get the hang of who was who and for them to ground each Musketeer into their familiar traits. But by the end of the season everything was coming together a lot more and I was starting to see the potential of each of the characters getting some more long term development than the isolated films have ever managed. The female characters actually didn’t suffer from that problem as much. I wasn’t sure why they’d changed Constance’s role from being the Queen’s maid to being… actually, I can’t even remember how she got involved with the whole thing, but other than that minor problem, each of the three women (Constance, Milady and the Queen) was an interesting mix of strength and emotion. One other thing the show did get right from the start at least was the production design. It looks both beautiful and right. Everything from the lavish French palaces to the leatherwork on the armour feels appropriately intricate. I also rather liked the style of the opening credits and the music that was used. Although again, it all fit a Saturday evening adventure series a little better than the 9pm drama slot. If the show had been in the 7pm slot on Saturdays, I would have come down a lot more favourably. I acknowledge that’s pretty daft, particularly as I rarely watched the show live, but I had different expectations for a Sunday at 9pm show. If you approach the show as moderately disposable entertainment, then I think you’ll be satisfied. But if you’re looking for more, I think you’ll be disappointed with the first season. I will look forward to next season with revised expectations, although losing Peter Capaldi to Doctor Who (ironically of course to the Saturday at 7pm time slot) will be a blow to the series, so we’ll have to see how they cope with that.